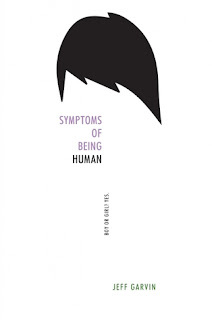 Symptoms of Being Human is the first book I've read about someone who identifies as gender fluid, and I have to say, the book was pretty educational for me. Not in a preachy way, but in an actual informative, useful way. Mostly because I didn't really know too much about gender fluidity and was interested in reading more about it. I suppose that people who already know a lot about it may have felt that the book was bogged down a bit by the explanations, but personally I appreciated them. I feel slightly bad about this, but the entire book I was dying of curiosity about whether Riley was biologically male or female. I understand that the point of the book is that it's none of our business, but sorry, I can't help this undying curiosity...I think the author deliberately chooses an gender neutral name, and stays away from labels of "he" or "she" in order to keep us curious. I mean, look at the cover. Even that gives you no clues. Riley's journey is not an easy one, and there was most definitely more than one point in the book where I was punched in the feels. There are a lot of bullying scenes where Riley is put on the spot for being male/female, and there are also a lot of scenes where Riley experiences anxiety related to her gender dysphoria, and it's hard to read it without feeling something. The only thing about the book that made it perhaps slightly less enjoyable was that the romance, while actually pretty good overall, had that feel of manic pixie dream girl (which isn't my favourite trope at the best of times), and there was also a secret of Bec's that felt a little too coincidental. Still, there were a lot of other things to keep me interested, and the other aspects of the romance weren't bad. If you're looking for an LGBTQIA (not too sure whether gender fluidity fits in that initialism to be honest...) book that is informative but also incredibly well written, look no further than Symptoms of Being Human.